“The new website serves as a wonderful 24/7 City ambassador. Avondale Estates is a forward-thinking, service-oriented and business-friendly City, and this new site shouts that from the rooftops,” said City Manager Clai Brown. The new website—available at the same URL as the old site, avondaleestates.org—just underwent a two-month redesign process by CivicPlus, a leading government website provider. The revamped website spotlights relevant and exciting City news and events on the homepage, as requested by the community in a survey promoted in City E-News and social media. The site also features improved navigation in the form of a drop-down mega menu, breadcrumbs and an automatically updated site map. The old site had static navigation—users had to click on a category, potentially navigating away from their current page, to view subcategories. City Hall regularly received calls and emails from people who couldn’t find what they were looking for on the 2009-launched website—not because the information wasn’t there, but because navigation wasn’t intuitive and the search function didn’t work. Accordingly, the new site features a robust search function and a cleaner, more readable design that’s compliant with the Americans with Disabilities Act. The site is also responsive, meaning the layout and navigation automatically adjust to best fit an array of devices, from widescreen desktop computer monitors to tablets and smart phones. Notifications: Visitors can sign up to be notified via email and/or text message about community activities, board meetings, emergency alerts and other updates to the website. Users can self-manage multiple subscriptions at once, and unsubscribing is easy. Alert Center: Provides an efficient and noticeable way to get important news out to the community, from local inconveniences such as street closures to critical, up-to-the-minute emergencies such as flood warnings. Alerts can be displayed on the home page and/or interior pages. Business Directory: As requested by the City’s Downtown Development Authority (DDA), this module provides site visitors with information about and links to City businesses and organizations, listed in alphabetical order and searchable by category. Commercial Real Estate Locator: Also requested by the DDA, this module allows site visitors—prospective Avondale Estates business owners, for example—to view commercial properties for sale in the area. With the new website, the City of Avondale Estates looks forward to increasing community engagement and enhancing communication between residents and businesses and their local government. Site improvements will be ongoing: In the coming weeks and months, City staff will closely monitor web analytics to determine what adjustments might help the new site be even more effective. 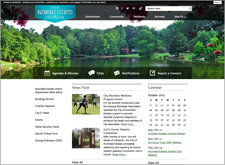 Starting Thursday, the City will also unveil a new E-News design to match the new website. The E-News is simpler and cleaner, and like the new website, more mobile-friendly. Citizens with constructive feedback on the new site or the E-News redesign are encouraged to email Communications Manager Debbie Revzin.